In the market for a new spotting scope? We review the top performers in each budget range in our massive guide to the best models currently available. 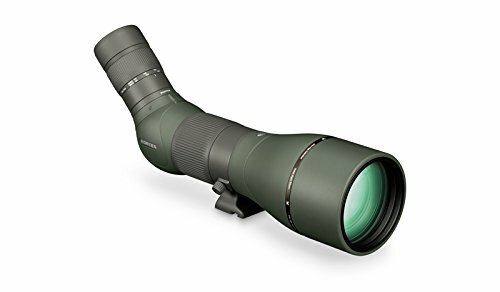 Spotting scopes are the premium optical device for bird watching and hunting. They offer a massive range and a clarity of image that can't be beaten. In today's post we recommend the top spotting scopes for every budget and hobby. Maybe you're adhering to a strict budget or maybe you've got a bit of money to play with, whatever the situation, we've got you covered. Besides our detailed reviews, we've also put together a buyer's guide that explains all the key features and terminology you can expect to see when reading about spotting scopes. If you're an experienced user then you might want to give this a miss, but first time buyers might want to start here. Spotting scopes come with a considerable amount of special features. In this section, we debunk the jargon and explain the key characteristics that you should be looking for when buying a new spotting scope. Our spotting scopes reviews make special mention of these features, so you can treat it a bit like a glossary too. Why get a spotting scope? Spotting scopes offer the best magnification and image clarity of all high powered sporting optics. Binoculars just can't compete with the long distance image definition that spotting scopes offer. They offer you the chance to get closer to the action than ever before. They are designed to be used primarily by bird watchers and hunters, and are usually mounted on a tripod. A tripod is often needed to steady the image at such high magnification levels. What do the 3 numbers mean? Unlike monoculars, spotting scopes are labelled with three numbers to describe the lens. For example, a model might be described as being 20-60x60. The first two numbers describe the range of magnification on offer. In this instance, the zoom ranges from x20 to x60. The third number describes the size of the objective lens (the large lens closest to the action). In our example, the scope has a 60mm lens. Spotting scopes come in 2 varieties. The more expensive models are usually available in both of these options. The choice is straight scope or angled? Straight scopes look a lot like monoculars or small telescopes. They have the eyepiece and barrel aligned in a straight line. Angled scopes on the otherhand, have the eyepiece offset from the barrel of the scope. The eyepiece is usually offset by 45 or 90 degrees. You should consider the landscape and environment in which you will be using the scope to decide which option is best for you. The straight barrelled design is considered easier for following fast moving animals. Personally, I find the fact that the line of sight being aligned with the eye makes it much easier to follow things like birds across the skyline. Also, consider the elevation at which you will be using the scope. If you are viewing a scene from an elevated position like a hill or mountaintop, then an angled scope will make the viewing posture really awkward and uncomfortable for you. Counter to this is viewing sights from below. 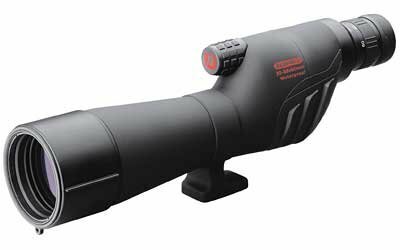 If you plan to view birds up in the sky or in the trees then an angled spotting scope is ideal. It's also more convenient for sharing, as it's more suitable for people of various heights to use comfortably. It's really a matter of personal preference, as technically there's nothing to split the two options. Generally, spotting scopes offer magnification between 20x and 60x. However, certain models exceed this. For anything below this, binoculars are just as effective. At high magnification levels the image is unsteady when the scope is held in-hand. On these occasions you will definitely want to use a tripod. The field of view also narrows as the magnification increases. Expect the brightness of the image to dim too. At high levels of magnification, scopes become very susceptible to atmospheric conditions like heat, humidity, and glare and also things like dust. For this reason, most scopes stop at x60 magnification. The most powerful spotting scopes are generally in this region. Spotting scopes with high magnification powers will also be heavier. This is because they require a large objective lens (the lens closest to the "action") so that enough light can be gathered. If you need a high powered scope with strong magnification then make sure that the lenses and prisms are of adequate quality to produce a good image. High magnification is no good if the glass and lens size aren't up to scratch. The objective lens is the large lens that is farthest from the eye. The size of this lens determines how much light the scope will gather. Generally speaking, the larger this lens, the better the performance in low-light conditions. If a lens can collect more light, then it follows that the image will be brighter and usually more detailed and clear (depending on the quality of the glass). The objective lens size is measured in millimeters (mm). This statistic is commonly called the aperture. The downside of having a large objective lens is that it will weigh more and probably cost more. When choosing an objective lens size, consider where you will be using the scope and in what type of conditions. If you plan on carrying the scope large distances then it might be worth compromising on the lens size in favor of portability. You might find a smaller lens operates just fine in very bright and sunny environments too. In other situations (especially if you plan on using it in low-light environments) it's probably best to go for the largest lens size that you can afford. If you're looking for the absolute best performance from a scope then you'll want a large objective lens made with high quality glass. You'll notice the top rated spotting scopes all adhere to this rule. The brightness of the viewable image depends mainly on the size of the objective lens but also something called exit pupil. This factor describes the diameter of light that can be seen through the eyepiece (measured in millimeters). If you hold your scope toward the sky at arms length you will see a bright round disc of light in the eyepiece. This light is in fact the exit pupil. The larger the diameter of the exit pupil, the more light reaches your eye. This in turn produces brighter images and gives better performance in low-light environments and when at maximum magnification. Exit pupil is easily calculated with a bit of simple math. Just divide the size of the objective lens by the magnification power. Example: A spotting scope has a 36x zoom and a 50mm objective lens. It is though that a scope should always have an exit pupil of at least 1.33mm. Any less then this would give poor performance in low-light conditions or at high magnification. Also, note that the ideal exit pupil for different optical devices is completely different. A good telescope or binocular for example, might have an exit pupil of more than 7mm. One last cautionary point is that a large exit pupil doesn't automatically mean amazing optical quality. It's a useful tool in gauging the performance level of a scope, but it should be used in combination with the other points we've highlighted in this guide. Great scopes exist with relatively small exit pupils, and likewise there are some useless models with large ones. The eyepiece is one of the most important parts of the scope. The magnification power depends on the eyepiece, and it also affects aspects like eye relief, exit pupil and the field of view. The top of the line scopes will not usually have an eyepiece included and this is something you might have to purchase separately. Zoom eyepieces are particularly useful for those that wish to scan a landscape at a wide field of view before zooming in on a point of interest. Fixed eyepieces that offer a wide field of view are also useful for those observing large areas. Note that eyepieces might be specific to a certain model or manufacturer. They are not all interchangeable. The field of view refers to the width of the image that can be seen. A larger field of view means a bigger view can be seen. It is commonly measured in feet at 1000 yards of distance, but it's sometimes measured as an angle too. The field of view tends to decrease with increasing magnification. Therefore a scope with x60 magnification will probably not have as large a field of view as one with just x40. A large field of view is also much better for viewing fast moving objects. Try following birds with a scope with a narrow field of view and you'll need reactions like a cat. If you wear glasses then you should pay close attention to the eye relief. The eye relief is the distance between the eyepiece and your eye at which you can still see a complete and focused image. When wearing glasses the distance between the eye and eyepiece is naturally a bit more, due to the extra glass between the two. Therefore wearers of glasses should seek a spotting scope with a longer eye relief. An eye relief of at least 12mm should be just fine for this. If you get a model that doesn't have a large enough eye relief then you'll find you might have to remove your glasses or press them uncomfortably against the eyepiece to get a good picture. Some models have adjustable eyepieces, which help avoid this problem. Close focus (or near focus) is the shortest distance between the scope and an object that gives a clear, focused image. As magnification power increases, the close focus distance also increases. A short close focus distance is ideal if you envisage looking at things that might come close to you, like a bird perhaps. Digiscoping also works better with a short close focus distance. Spotting scopes are generally quite fragile devices. The internal barrel must stay free of moisture and dust, and it contains fragile glass and prisms. Then there are the outer lens surfaces that must stay pristine. Some scopes are waterproof and most are fog proof. Fog proof just means that the insides won't mist-up, as they have been nitrogen purged. The more durable scopes will also have a rubberized armor-like coating that protects them against the smaller bumps. If durability is a primary concern of yours then maybe a monocular would be a better option. These aren't as powerful as scopes, but they are smaller, lighter, and better equipped for life in the wilderness. If you need a solid hunting spotting scope then look for features such as waterproofness, scratch-resistant lens coatings, and rubber armor. Special coatings are also applied to the glass to increase light transmission and decrease reflections. Fully Multi-Coated - this is the best level of glass coating available. Each air-to-glass surface is coated multiple times. Multi-Coated - one air-to-glass surface is coated many times. Fully Coated - every air-to-glass surface is coated just once. Coated - at least one air-to-glass surface is coated once. Sadly, there is no industry standard that defines the number of coatings or even what the coating process entails. Unless the manufacturer is keen to disclose this information, it's very hard to tell between the quality of the coatings from one model to another. The quality of the glass is the primary feature that separates the good from the great. High quality glass gives better image clarity and detail, and also better performance in sub-optimal light conditions. But, it also adds digits to the price tag. Fluorite glass (FL) - doesn't suffer from chromatic aberration like traditional lens glass. It has low dispersion and a low refractive index. It's also lighter than traditional glass. Extra-low dispersion glass (ED) - very similar to fluorite glass. It's sometimes called HD glass. Read more. Apochromatic glass (APO) - similar again to fluorite. It reduces chromatic aberrations. These glasses give better image clarity but they do come at a price. However, if you're serious about your hobby and want the most detailed image possible then it's really worth the investment. 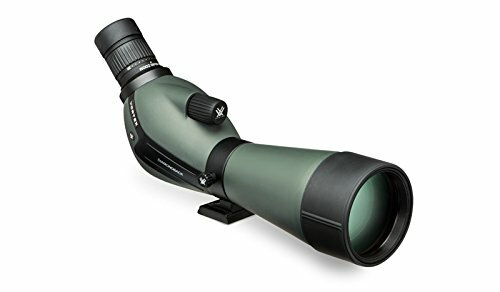 A good spotting scope for sale will always mention the type of glass used in its lenses and prisms. Even the best cheap spotting scope won't use this type of glass. Compare the key features of our recommended scopes in the table before reading the more detailed reviews that follow. We choose the overall top performing spotting scope around, besides making our picks for a range of budgets. 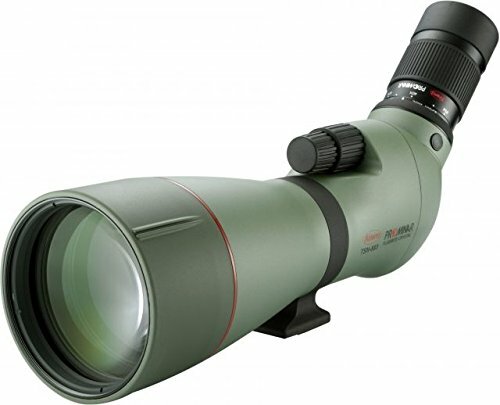 The Roxant Blackbird HD is our choice for the best affordable spotting scope. It surprised us just how much this costs, considering some of the performance statistics. However, it's by no means the best scope out there, and it doesn't compare to those that have a couple of extra digits on the price tag. But, for those that are just beginning their journey with spotting scopes or are running on a strict budget, then this is probably the scope for you. The Roxant Blackbird isn't the most powerful of scopes on the market with a 12 - 36x zoom. However, this does give it good exit pupil size and therefore a decent performance level in low-light conditions. This also allows it to use a smaller objective lens than the competition (50mm compared to at least 60mm). The lenses are fully multi-coated, which is a good sign, but as we highlight in the buyer's guide it's hard to distinguish to what degree this adds to the performance without the manufacturer making a point of telling us. The smaller objective lens allows the Roxant Blackbird to weigh just 490g and measure only 232mm x 135mm x 78mm. It's easily one of the lightest and most portable of the spotting scopes on offer today, and a scope worth consideration if you do a lot of hiking. Impressively, the Roxant Blackbird uses Bak4 glass in its prisms. This glass is among the best available and delivers accurate color fidelity and impressive image clarity and resolution. It's a massive improvement on the BK7 glass that you would expect to find in a scope in this budget range. It features an adjustable eyecup that gives enough eye relief to wearers of glasses. This also means the Blackbird is perfectly suited to being shared with others. Bottom Line: The Roxant Blackbird HD offers incredible value for money. Hands down the best spotting scope under 100. It's also one of the lightest and most compact spotting scopes we're aware of. The Redfield Rampage is another scope that offers outstanding value. It's the cheapest of our selections that offers 60x magnification. It's aimed at the hunting market and features like a retractable lens shade and waterproof body make it well suited to the spontaneity that life in the wilderness brings. With a minimum focus distance of just 6 meters and a generous field of view that reaches as much as 125 meters @ 1000 meters of distance, it's well suited to tracking moving targets too. One slight point of concern is the exit pupil size which ranges from 3.0mm to 1.0mm. In my opinion, this isn't enough light to work well when conditions aren't optimal. This isn't a problem if you plan on using the scope in bright, sunny weather, but if you need an all weather, all conditions tool then I'd give this a miss. The Redfield Rampage also uses the Bak4 prisms. These offer better image clarity than their cheaper Bk7 counterparts. The lenses are also fully multi-coated to improve image clarity and definition. Redfield make a big deal about the polycarbonate body which they say is lightweight. However, this weighs more than double what the Roxant Blackbird weighs (see previous review). The larger objective lens and increased magnification are obviously factors here, but it's not exactly lightweight. Only in comparison to juggernaut scopes by Swarovski and Kowa would I be inclined to say so. It comes with all the pieces needed to take this scope on the trail. There's a compact tripod and soft storage case included. It actually comes with a limited lifetime warranty too, which is a nice touch at this price point. Bottom Line: Another big hitter in the value for money department. It's not without it's shortcomings, but it's an impressive piece of kit at this price bracket. Definitely one of the best budget scopes. The Kowa TSN-883 is a premium bird spotting scope that is matched with a premium price tag. The old "get what you pay for" saying, rings truer with scopes than most other things as it's the quality of the glass that really defines their performance. The Kowa 880 series use pure fluorite crystal, which is the best material for reducing color blur (chromatic aberration). Fluorite glass is simply the top glass in the business and it reproduces fine lines and detail like no other lens material. Besides the quality of glass, the other standout feature of spotting scopes in this price bracket is the quantity of it. The Kowa TSN-883 has a huge 88mm objective lens. This certainly adds weight to the 880, but that's more than made up for by the amount of light it's bringing to your eye. Expect brighter images, especially round the edges and also excellent low-light performance. 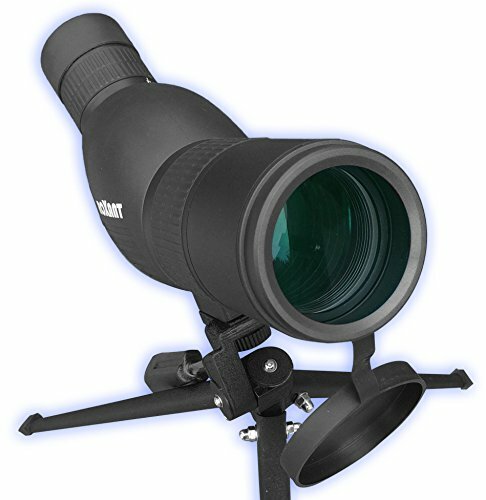 This will work beautifully at dusk or dawn when other scopes struggle most. The 883 is compatible with 2 external eyepieces that need to be purchased separately. There's the fixed 25x option and the variable 25x - 60x zoom. The eyepiece adds another 370g to the overall weight, as well as adding to the overall cost. It's quite a substantial size and weight, so it's not really the scope built for large treks. However, it offers the best clarity and definition around, so it might just be worth lugging those extra pounds around. I wouldn't say it's the most durable unit around, but it is waterproof to Japanese Industrial Standard 7 (it's Japanese built). This means it can resist being immersed in water for short periods, and it'll shake-off a rainstorm no problem. The chamber has also been filled with dry nitrogen gas to prevent fogging/misting. The focus mechanism of the Kowa 883 is also something a bit different. It uses a dual focus system of both quick and fine focusing. The quick focus is like the name suggests, quickly and easily adjusted, with just two rotations bringing the focus from maximum distance to just 5 meters range. The fine focus gives ultimate accuracy and makes this model perfect for digiscoping. The body is made of a magnesium alloy and shaped using a process called thixotrophic molding. This technique allows Kowa to keep the weight down (when compared to other models with large diameter lenses) and gives it a sturdy feel in-hand. The Kowa TSN-883 comes with a lifetime warranty to protect your investment. It's also available in both angled and straight scoped options. Bottom Line: The Kowa TSN-883 offers image clarity and definition that is hard to match. If you're serious about your hobby and not adhering to a strict budget, then this deserves your consideration. 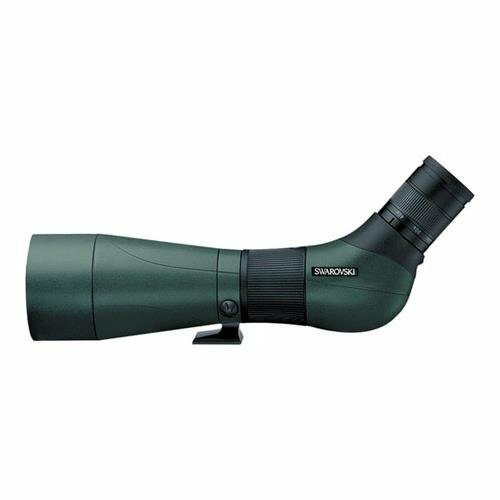 Alongside the Kowa TSN-883, this Swarovksi ATS-80 is the other top of the range bird spotting scope that we have included in our selections. That's not to say the others aren't high quality, but these two are more like the Ferraris of the optical world. And they are priced accordingly. Swarovski have been in the business since 1949, and were founded on a passion for sports optics. Before we get into the details, let us clarify that the ATS-80 can be used with 2 additional eyepieces. The eyepiece is not included and needs to be purchased separately. The eyepieces offer the choice of 20 - 50x magnification or 20 - 60x. For the purpose of this review we focus on the 20 - 60x variety. The 20 - 50x zoom option obviously sacrifices some magnification but has a wider field of view. Swarovski are well known in the world of optics for the quality they produce. The ATS-80 has all the premium features you would expect of something bearing this name, and the definition and clarity of image that it produces is among the best around. This ATS model is the angled version, with the STS model being the straight barrelled model. The ATS-80 has an enormous 80mm objective lens. While you may notice that this is smaller than the rival Kowa TSN-883 which has an 88 mm lens, the Swarovski has a considerably bigger exit pupil size throughout most of the magnification range (the Kowa has a bigger exit pupil at x60). This means excellent low-light performance and an overall brighter image than you would get from scopes in the lower price brackets. The image from the Swarovski is easier on the eye, and leads to more comfortable viewing for long periods. As you would expect the ATS-80 uses top quality glass. The lenses are made of fluoride which keeps the color fidelity high, and gives the crispest images in the spotting scope world. The big objective lens does add some considerable weight to the scope and it is the heaviest of our recommended models. Alongside the financial cost, I'm afraid this is just one of the drawbacks in the quest for the perfect spotting scope picture. Quality glass is heavy, and ideally the more of it the better. Like all Swarovski scopes, this is backed by a lifetime warranty. Bottom Line: Exceptional performance in all lighting conditions. You'll be a Swarovski customer for life after seeing the caliber of image that this scope provides. The Vortex Optics Razor HD is a top quality hunting spotting scope that is aimed more at the hunter. It gives high optical fidelity but remains durable and lightweight. It's available in a variety of lens and zoom variations and also with straight or angled bodies. In this review, we focus on the 27 - 60 x 85 straight bodied version. It uses a huge 85mm objective lens with a powerful 27 - 60x magnification. That also makes it the most expensive of the Razor HD range. The Razor HD uses APO glass (Apochromatic) combined with HD glass to give clearly defined and sharp colors. This glass isn't quite on par with fluorite but it's the next best thing. The lenses are fully multi-coated with Vortex Optic's proprietary coatings. They are designed to increase light transmission and reduce destructive reflections. These coatings help to create the bright image that the Razor HD is known for. The 85mm objective lens is a monster and helps the Razor HD produce some of the best exit pupil stats on offer. It's got some great low-light performance and works better than most at those prime hunting times, when the light is low. It's also one of the sturdiest and most durable spotting scopes around. It's waterproof, fog proof, has rubber armoring, and the lenses are coated in ArmorTek. ArmorTek is a hard, scratch-resistant coating that protects the exterior lens surfaces. The Razor HD is much better suited to life in the wilderness than most spotting scopes. The built-in sunshade and adjustable eyecups are further details that offer a level of convenience that's hard to match. The Razor HD is heavy on features, but importantly they each have a real purpose and are incredibly well implemented. These features help define it as the premium spotting scope for hunting on the market right now. Bottom Line: A top hunting spotting scope that combines durability with excellent optics. While the Razor HD is the premium model from Vortex Optics, the Diamondback is the slightly more wallet friendly option that still manages to pack some impressive features. Like the Razor HD, it's aimed more at the hunting crowd and is built to last the demands of life off the beaten track. It's waterproof, fog proof, and has the same rubber armor to protect it from bumps and scrapes. The big difference here is in the lens. While the two models both boast huge objective lenses. The Diamondback's is slightly smaller, doesn't use the same glass, or have the same level of coatings. That doesn't make it a bad scope by any means, it just puts it in a price bracket that is much more appealing and affordable for most. However, the different lens does make the Diamondback considerably lighter. Over 0.5kg lighter actually, which is the kind of weight that can really make a difference when lugging gear through difficult terrain. It also manages to maintain a really good exit pupil size. This means it will still gather good a deal of light when conditions are sub-optimal. Like the more expensive Razor HD, it's good to go at dusk or dawn. Like its bigger brother model, it too has adjustable eyecups and a retractable sunshade. Bottom Line: If you don't have the budget for the Razor HD, this is an excellent alternative. It's a top hunting spotting scope that makes quality optics more affordable. In our opinion, one of the best value spotting scopes around. That brings us the end of our guide to spotting scopes. We'll add to this list as and when we discover new scopes that we believe add to the quality that's on offer here. We'd love to know of any top quality scopes that you recommend too. Leave us a comment down below or message us using the contact page. If you're interested in other optical devices, then we recommend our guide to tiny cameras next. There's lots more coming here at Stealthy Ninjas over the near future so make sure to check back soon or follow us on Facebook (link on the right). Don't worry, we won't fill your newsfeed full of nonsense. We only post when a new article goes live or when we find something interesting and worth sharing.